The First Enlarged Meeting of the Seventh Central Military Commission of the Workers’ Party of Korea was held at a time when the entire Party, the whole army and all the people are dynamically waging the general offensive to achieve a fresh victory in the revolution by demonstrating the mettle of heroic Korea—true to the spirit of the Seventh Party Congress and the Third Plenary Meeting of the Seventh Party Central Committee. Kim Jong Un, Chairman of the Workers’ Party of Korea, Chairman of the Central Military Commission of the WPK, Chairman of the DPRK State Affairs Commission and Supreme Commander of the Korean People’s Army, presided over the enlarged meeting that brought together members of the CMC of the WPK, commanding officers at service and corps levels, senior officials of military organs and those of the Party Central Committee. The agenda items included organizational measures to be taken in order to strengthen the People’s Army into a revolutionary army of the Party militarily and politically and improve the national defence affairs as a whole, on the basis of the comprehensive analysis of the requirements of the developing revolution and the current situation of the People’s Army. The meeting also dealt with the organizational issue on dismissing and appointing some members of the Party Central Military Commission and removing, transferring and appointing senior officials of military organs. 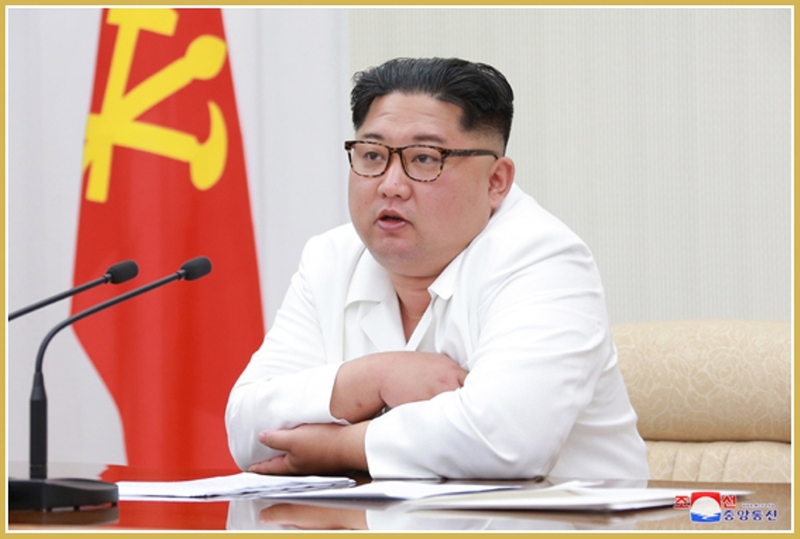 Supreme Leader Kim Jong Un reviewed how the People’s Army has carried out its military and political tasks since the Seventh Party Congress and specified the main direction and ways of army building and military activities, stressing the need to further establish the Party’s unified command system across the revolutionary forces and exercise the revolutionary military discipline, to consistently implement the Party’s policies on effecting a radical turn in training and ideological work and modernizing the army, and to improve the soldiers’ living standards. He called on the whole army to safeguard and guarantee by dint of arms the all-people efforts to implement the decisions of the Third Plenary Meeting of the Seventh Party Central Committee. He highly appreciated the People’s Army that is fulfilling its duty as the vanguard ranks and main force of the revolution on every major front of socialist economic construction upholding the banner of “Let us take upon ourselves both national defence and socialist construction!” And he was hopeful that the People’s Army would maintain its revolutionary nature and features as the army of the Party and leader and fulfil the sacred mission and duty it assumes on behalf of the country and people.